Like most people, I have used sysvinit to control which services are run on boot for years. In recent years, a replacement for sysvinit called systemd has been developed and is now appearing in most Linux distributions, such Debian and Raspbian. Systemd is designed to start system processes in parallel to achieve faster boot times. The older SysVinit started processes sequentially, meaning everything has to wait for a slow service e.g. getting an IP address through DHCP to complete, not just those services that depend on it. If you have a Python script that you want to run every time on boot, you will have read about using rc.local. This is a simpler way of doing things than in my case where I use a full daemon mechanism. SysVinit is an old-fashioned and outdated way of doing things. This guide is aimed at users looking to migrate away from rc.local and SysVinit daemons to the new systemd way of working. Systemd does all of the above for you, so all you need is your Python script as you would run it at the terminal and a simple .service file. You need to substitute _CURDIR_ with the full path of your script. You can set the user/group that systemd runs your script as by changing myuser and mygroup to a suitable value. Leave these lines out completely if you want to run as root. Any output from your program that would normally appear at the console, for example error messages or informational messages from a print() statement are set up to be stored by syslog so that you can still look at them if necessary. If your script should fail for any reason, the Restart line tells systemd to restart your service. Normally in a Python script, you would have the first line stating which version of Python to use (the ‘shebang’ line). In our case, to ensure smooth logging, we add the ‘-u’ switch to disable buffering on stdout/stderr which would delay any log messages from appearing. I hope there is enough here to help you migrate your Python script from sysvinit to systemd. I realise that systemd is a lot more powerful and complicated than sysvinit and that there is an awful lot more to know than what I have included here. Remember the reasons for moving your code from Python 2 to Python3? I would say that a lot of the same reasons apply for the move from sysvinit to systemd. If you stay with the old way of doing things, eventually both you and your code will become old and obsolete. It is intended as a guide to getting everything installed and configured, not as a tutorial in actually using Python, Django etc. The above toolchain is suitable for a fairly heavy duty production environment. For this tutorial, we are using the PostgreSQL DBMS. You could quite happily use MySQL or SQLite instead if you prefer. Mod_wsgi is an apache module that enables the use of Python’s WSGI (web server gateway interface). In other words it lets you run Python scripts under Apache web server. Here we assume your Django project is called ‘mysite’ and runs on the server ‘yourhost.yourdomain’. Substitute these values with more suitable values to match your project. This makes sure that things still work if the DNS stops working for whatever reason. It is also faster than DNS lookups. If you are running behind a NAT router, make sure you enter your internal IP address here, not your external IP address. Here, we create the directory under /var/www where websites normally live. The file permissions must allow suitable access by the apache user as well as write access by yourself. Python Virtual environments are a Good Thing (TM). They allow you to control the dependencies of your project in an independent manner from any other projects you have installed. This way, you can allow different versions of Django and other Python modules for each project. If you have a device-wide installation of Python modules, it could break some of your sites when your do an upgrade command! From this point onwards, we assume everything you do is within this virtual environment. Note that the following shell script will delete your database and database user if it already exists! It is a good idea to have a separate user for each individual project – this way if your website is compromised, it can only affect one project. If you now go to your web browser and load your site, you should get the initial Django ‘It Worked!’ page. At this point, it is probably a good idea to put your Django project into a source code repository, such as git. This is outside the scope of this guide. At Blackpool Raspberry Jam today, I taught @all_about_code the basics about turning his EduPython Python module into a Python Package on PyPi. This guide is written assuming you are using Python 3 under Raspbian or Debian Jessie. Make sure your module contains docstrings for every function, and for the module itself. This is very useful for many reasons as we will see later – after all people need to know how to use your Python module. Choose a licence for your module. (For American readers, note that in the USA you spell it ‘license’ instead). Store a copy of your licence in the file LICENCE.txt. There are many licences to choose from, but my personal favourite is the MIT licence because it does not have many restrictions and it is simple. Other suitable licences for Python modules would be BSD, Apache or LGPL. I would not use the GPL licence for a Python package because any projects that use it are forced to use the GPL licence too. This may prevent some people from being able to use your library. For the list of classifiers that you can use, see https://pypi.python.org/pypi?%3Aaction=list_classifiers. Use as many as you think is relevant to your package. Rename your module to be __init__.py within the ‘mymodule’ directory. We are nearly finished now. This is probably a good point to place your package in source code control on something like Github or similar. Today I have attended a CAS workshop as an computing professional at Lancaster University. The object of the session was to network with teachers and have a play with Micropython on the Microbit. We worked in groups and finished the evening with a ‘show and tell’. The reference manual for micropython on a microbit is here. While this is essential reading, I decided it would make things easier with a summary on a single sheet of paper next to me. I created a quick reference sheet. 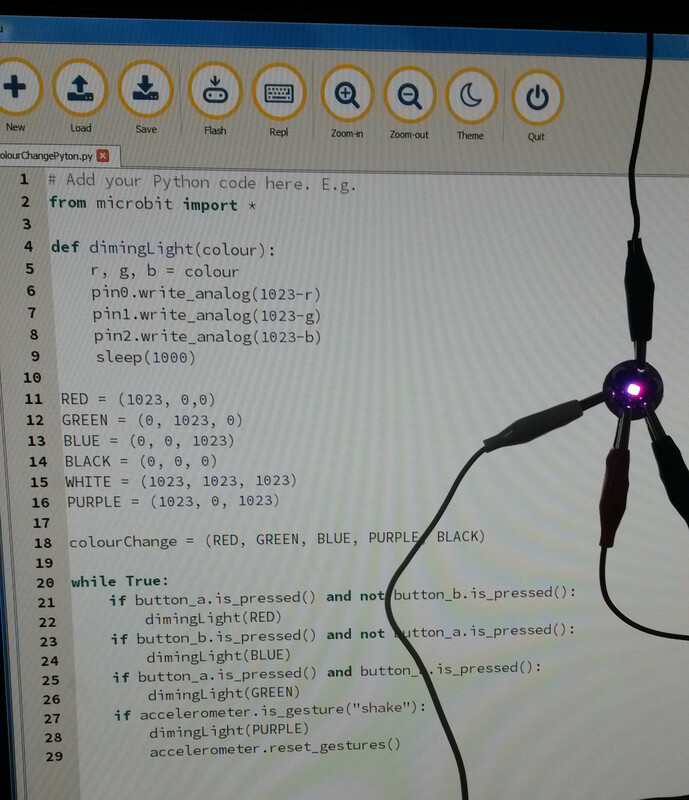 There are two ways to use Python on a microbit – the online editor or the Mu editor. We chose to use Mu because it is more responsive and integrates better with the microbit. 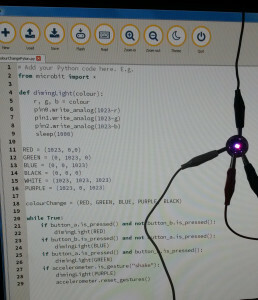 It is an active-low RGB LED wired up to the microbit using crocodile clips. You can change the colour by pressing different buttons on the microbit or by shaking the microbit. Here is an experiment I did on my Dad’s Raspberry Pi after reading an article in the MagPi. ‘make altinstall’ instead of ‘make install’ – note that doing this no longer sets the default python3 to the copy you are building – you have to use python3.x instead. I tend to use virtual environments these days to have better control over the versions in use. Added –enable-optimizations to the configure step. This makes builds much slower but you can remove this if you are impatient. Added —enable-shared to the configure step. This was needed for mod_wsgi builds and is a default option in Debian package builds anyway.